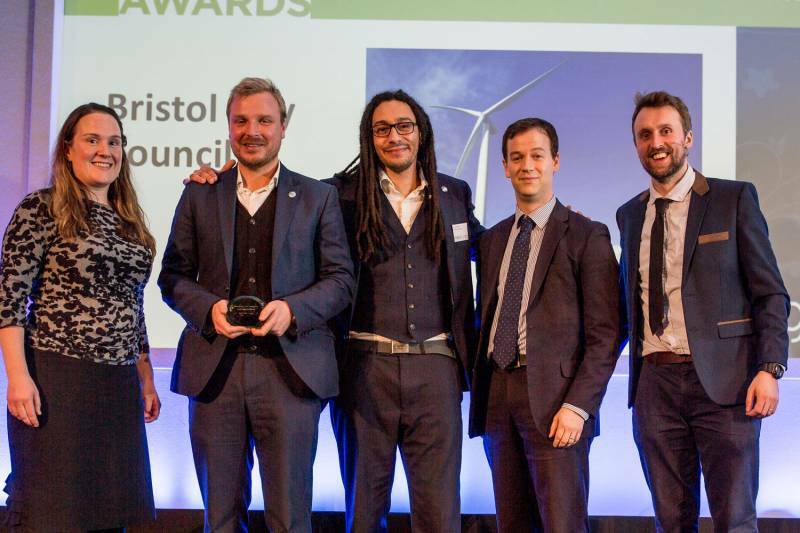 This week Bristol City Council received a first place award for Local Energy Leadership at the National Green Energy Awards, organised by Regen. The award is in recognition of the council’s achievements in the energy sphere over the last decade and its strong commitment towards achieving carbon neutrality. Bristol City Council was nominated alongside Devon County Council and the Welsh Government, which were commended for their excellent leadership in the energy field. Councillor Kye Dudd, Cabinet Member for Energy, Waste and Regulatory Services attended the awards ceremony on 27 November in Bath’s Assembly Rooms. Councillor Kye Dudd said “Bristol City Council is leading by example in taking action against climate change and has committed to Bristol becoming a carbon neutral city. The council’s award winning Energy Service is a driving force behind this activity, together with colleagues from many other Services across the council, delivering projects that benefit the social, economic and environmental health of our city and partners across the region. More information on the council’s energy achievements can be found on our About Us page.